Many people are unaware of the fact that one of the largest Acadian cemeteries established before the Deportation of 1755 lies within the grounds of Grand-Pré National Historic Site of Canada. Although this cemetery is invisible, we feel that it is more than worthy of our attention because it is the sacred resting place of several generations of Acadian families. Not far from the memorial church at Grand-Pré, you will see a sign erected by Parks Canada indicating the presence of the cemetery of the former parish of Saint-Charles-des-Mines. The sign states that “For approximately 65 years part of the land between the Memorial Church and the present-day Grand Pré Road served as the parish cemetery of Saint-Charles-des-Mines.” This sentence obviously presupposes that every visitor would know that the parish in question was founded in 1686 and that it survived until August 1755 when the village of Grand-Pré was occupied by the soldiers of two regiments from New England under the command of Lieutenant Colonel John Winslow. It is customary nowadays to use the name Saint-Charles-des-Mines when referring to the old parish in Grand-Pré. However, a number of other names frequently appear in eighteenth-century documents, including: Saint-Charles-aux-Mines, Saint-Charles à l’Acadie, Saint-Charles de la Grand’Prée, and Saint-Charles de la Grand’Prée aux Mines. Because of the copper outcroppings along the shore, the French used the name “les Mines” not only for the first settlement, but also when referring to the whole area around what is now known as Minas Basin. Gradually, the name Grand’Prée was used for the settlement. In old French, the word for meadow was written as a feminine noun (prée) because the plural form in Latin (prata) was mistakenly assumed to be feminine. The second sentence on the Parks Canada sign states that “The location of the cemetery was confirmed when two local people found a coffin during excavations in the late 1800s.” In fact, evidence suggests that one coffin was unearthed in the late 1870s and another one around 1895. It was because of these discoveries that a large stone cross was erected in 1909 by John Frederick Herbin to mark the presence of the old cemetery. About fifteen years later, a group representing the Acadians placed a bronze plaque on the cross to pay tribute to Herbin and his efforts to save the land that once formed the heart of the old village of Grand-Pré. Although the sign does not say so, Parks Canada carried out archaeological digs in 1982 near the Herbin cross. Directed by Anita Campbell, these very limited digs uncovered evidence of four graves. In 2004, another grave was found accidentally when a sign post was being installed and six more graves were discovered during the 2008 archaeological digs carried by Jonathan Fowler and his students from Saint Mary’s University. Despite these finds, we still do not know the exact boundaries of Saint-Charles-des-Mines cemetery. In all likelihood, it was relatively large since Grand-Pré was the most populated of all the pre-Deportation Acadian settlements. On numerous occasions in his journal and letters, Lt. Col. John Winslow uses the term “church yard” when referring to the cemetery in Grand-Pré. Jeremiah Bancroft, one of Winslow’s officers, indicates in his journal that a palisade was built around the “burying place.” Without knowing their exact location, we know that the Saint-Charles church and cemetery were both inside this wooden palisade constructed to protect the British soldiers. 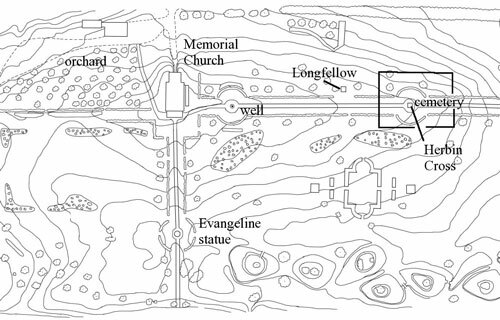 Based on information in the Winslow and Bancroft journals and on his own research in the field, archaeologist Jonathan Fowler has created a map showing the probable boundaries of Saint-Charles-des-Mines cemetery. It is impossible to know the precise number of people buried at Grand-Pré not only because several of the parish registers have disappeared, but also because there was often no resident priest available to record the deaths. Despite these shortcomings, it is estimated that approximately 400 burials took place between the late 1690s and the fall of 1755. The surviving registers, now in the possession of the Diocese of Baton Rouge, contain entries for 180 deaths. In 118 cases, the entry indicates clearly that the individual was buried in Saint-Charles-des-Mines cemetery. Over a third of these burials were those of children under the age of ten. What would Saint-Charles-des-Mines cemetery have looked like? Once again, there is no precise answer. However, based on the drawing of the cemetery that appears in a detailed map of Port-Royal drawn in 1686 by the French cartographer Jean-Baptiste-Louis Franquelin, we can assume that the cemetery in Grand-Pré was surrounded by a fence, that there was a large central cross, and that some of the graves were marked with a wooden cross. It is important to note that there is no written or archaeological proof that the French in Louisbourg or the Acadians in Port-Royal, Grand-Pré or elsewhere used stone monuments to mark their graves. However, two historic documents mention wooden crosses. In his report on the desecration of the Mi’kmaq cemetery near Port-Toulouse (an Acadian outport of Louisbourg) perpetrated in 1745 by soldiers from New England, Father Pierre Maillard states the following: “The burying place of the Savages was demolished, and all the crosses, planted on the graves, broke[n] into a thousand pieces.” If the Mi’kmaq marked their graves with wooden crosses, one can assume that the French and Acadian Catholics in Nova Scotia did likewise. In his description of his travels in the Tatamagouche region in 1790, James MacGregor, a Protestant minister from Scotland, refers to the remains of an Acadian cemetery with wooden crosses marking the graves. The historian Marie-Aimée Cliche has analysed the attitudes of Catholics with regard to death based on hundreds of last wills and testaments written between 1680 and 1760 in what is now the province of Quebec. The testators and testatrices often indicate their preference regarding the location of their grave (in the church or in the parish cemetery), but they make no mention of a tombstone. The absence of any evidence of stone markers in Acadian cemeteries established in the early decades after the Deportation seems to confirm that masses said for the souls of the dead were far more important than monuments for the graves of the deceased. According to the historian and folklorist Georges Arsenault, in some areas, Acadians used to say that fifteen masses said for a deceased person would ensure that he or she would go to heaven. Consequently, Acadians who had the means would designate in their will a specific amount of money for the celebration of masses so that their soul would rest in peace. There are no monuments that commemorate in stone the inhabitants of Grand-Pré buried in Saint-Charles-des-Mines cemetery, but the parish registers, albeit incomplete, are extremely informative. Let us pay tribute to several of the exemplary people who left this world in Grand-Pré. Let us begin with Father Bonaventure Masson, the only priest buried at Grand-Pré. Father Masson was a Récollet missionary who served the parish from 1700 to 1711. He returned to Saint-Charles-des-Mines in 1714 but became ill a few months after his arrival. The parish register indicates that his burial took place on February 16, 1715. During his posting in this parish, Grand-Pré was attacked by Colonel Benjamin Church’s and his New England soldiers who pillaged the church, broke the dykes, killed the cattle, and burned almost all the houses. They also took a number of prisoners. It is possible that the first registers for Saint-Charles-des-Mines were destroyed during this 1704 attack. The following year, Louis XIV, the king of France, sent a chalice, a ciborium, a monstrance, and vestments to the parish of Saint-Charles-des-Mines. Pierre Melanson and his wife Marie-Marguerite Mius d’Entremont were one of the first couples to move from Port-Royal to Grand-Pré in 1684. Pierre was one of the sons of Pierre Melanson who came to Acadie around 1657 during the English administration under the leadership of Thomas Temple. Marguerite was the eldest daughter of Baron Philippe Mius d’Entremont. Although the parish registers for the early years are missing, it is believed that Pierre and Marie-Marguerite are buried in the Saint-Charles-des-Mines cemetery. However, at least three of their children died and were buried at Grand-Pré. Their names are Marguerite, Philippe and Pierre. Marguerite Melanson married Alexandre Bourg dit Belle-Humeur. He was a notary and represented the Acadians of the Grand-Pré or Minas region for negotiations with the British administration in Annapolis Royal (formerly Port-Royal). Alexandre’s career ended in 1744 when he was accused of negligence and collaboration with the French, specifically, with his son-in-law Joseph LeBlanc dit Le Maigre and with François Du Pont Duvivier, his nephew and a captain in Louisbourg. Marguerite died on July 15 of that same year, at the age of 68. Her burial was held in Grand-Pré the following day. Alexandre and Marguerite had 16 children. On January 12, 1746, their two year-old granddaughter, also named Marguerite, was placed in her tiny grave and buried in the Grand-Pré cemetery. Her parents were Bénoni Bourg and Françoise LeBlanc. Marguerite’s brother, Philippe Melanson, had married Marie Dugas. Their house was located on the shore of the Gaspereau River in the village called Melanson – a picturesque location which is still admired today. Philippe also served as deputy for the region. His duty was to represent the interests of the Minas inhabitants in dealings with the British administration in Annapolis Royal. Both Marie and Philippe are buried in Grand-Pré’s cemetery. Marie died at the age of 59, on September 20,1733. Her husband was 80 when he died on June 24, 1744 (just one month before his sister). Scattered by the Deportation, none of their nine children are buried beside their parents in the cemetery of Saint-Charles-des-Mines. Their son Pierre died in Halifax, their daughter Madeleine died in Yamachiche in Quebec, their daughter Marie died in Southampton, England, Angélique in Liverpool, England, Marguerite in Morlaix, France, and Pierre in Belle-Île-en-Mer, France. Finally, Marguerite-Josephe made it to the parish of St. Gabriel in Louisiana, the same place where three of the surviving parish registers surfaced. Could she have been the one who preserved them for us? Like the Melansons, the Tériot family also played an important role in the Minas region. Pierre Thériot and his wife Cécile Landry had the reputation of being very welcoming. Having no children of their own, they offered lodging and support to the young men who came to the Grand-Pré area to develop their lands and build their homes before relocating their families. Ultimately, this practice led to a certain amount of gossip, which eventually involved the parish priest, the governor of the colony, and even the bishop in Quebec! As you can see, life was not always as idyllic as you might think! After Pierre Tériot’s death at the age of 60, on March 21, 1725, his widow Cécile later married Estienne Racois dit Derosie, a master surgeon. Both Cécile and Estienne are buried in Grand-Pré. Estienne died on January 30, 1732 at the age of 48. Cécile left this world at the age of 78, nine years after her husband. Cécile’s sister, Marie, died at the same age and their brother Claude died at the age of 86. These siblings are all buried in the cemetery at Grand-Pré. Just like today, some Acadians lived to a ripe old age. One of the daughters of Claude Thériot and his wife Marguerite Cormier was also called Marguerite. A the age of 18, she married Joseph Suret on the October 17, 1730, five months after their father’s death. In the presence of their families and friends, they placed a cross next to their names in the parish register. Many of their descendants now live in New Brunswick. A few years later, Joseph Suret’s brother Pierre married Catherine Bro of the nearby community of Rivière-aux-Canards. Her cousin, Jean Brault, was buried in the cemetery of Saint-Charles-des-Mines on February 8, 1747. He was 48 years old. The date is intriguing since the famous Battle of Grand-Pré took place three days after the documented burial. Historians believe that the family home of the LeBlanc’s was located not far from the old church of Saint-Charles-des-Mines. In October 1742, Amant LeBlanc died and was buried in Grand-Pré at the age of 23. He had not achieved the age or reputation of his famous brother René, the Grand-Pré notary immortalized by Longfellow in his poem Evangeline. René’s first wife was Elisabeth Melanson. His second wife, Marguerite Thébeau had 17 children. René became a father three more times with his third wife whose name we do not know. René is buried in Philadelphia, far away from his native village and his ancestral burial place. The Gautrot and Rimbeau family names appear frequently in the available parish registers of Saint-Charles-des-Mines. We can learn from census records that these families lived in the Gaspereau region, near a Mi’kmaq First Nations encampment. Research shows marriage ties between these families. Members of other Acadian families who had close family ties to the Native People of the area, passed away in Grand-Pré. Pierre LeJeune dit Briard was 17 years old when he was buried on September 16, 1736. His uncle, married to Marie Thibodeau, was well known in the Cap-Sable region of Southwest Nova Scotia. Historical documents show us the importance of alliances between the French/Acadians and the Native People especially with regard to the fur trade. Diocese of Baton Rouge Catholic Church Records, Vol. 1a revised, The Registers of St. Charles aux Mines in Acadia 1707-1748, Baton Rouge: Diocese of Baton Rouge, Department of Archives, third printing 1999. [This hard-covered edition of the surviving registers is a translation of the French transcription of the original documents. The entries do not always contain all of the information that appears in the original French. For further details see: http://institutdrouin.com or http://www.ancestry.ca. Grand-Pré National Historic Site has a digitalized printed copy of the original registers owned by the Diocese of Baton Rouge. Lt. Col. John Winslow’s List of the Acadians in the Grand-Pré Area in 1755, Société Promotion Grand-Pré, 2002 (booklet available from the Boutique at Grand-Pré National Historic Site). James Candow, The Deportation of the Acadians, Société Promotion Grand-Pré, 2003 (bilingual booklet available from the Boutique at Grand-Pré National Historic Site). Régis Brun, Les Acadiens avant 1755: essai, Moncton: self-published, 2003. Marie-Aimée Cliche, “Les attitudes devant la mort d’après les clauses testamentaires dans le gouvernement du Québec sous le Régime français,” Revue d’histoire de l’Amérique française, 32:1, 1978. Brenda Dunn, A History of Port-Royal/ Annapolis Royal : 1605-1800, Halifax: Nimbus Publishing, 2004. A. J. B Johnston, Life and Relion in Louisbourg, 1713-1758, Montreal and Kingston: McGill-Queen’s University Press, 1984. Pierre Maillard, An Account of the Customs and Manners of the Micmakis and Maricheets Savage Nations, London: S. Hooper & A. Morley, 1758. Margaret C. Melanson, The Melanson Story: Acadian Family, Acadian Times, Toronto: self-published, 2003. George Patterson, Memoirs of the Rev. James MacGregor, Philadelphia: Joseph M. Wilson, 1859. 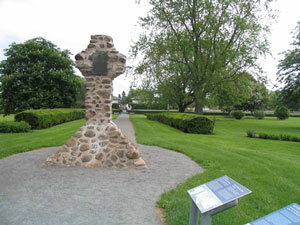 This photo shows the stone cross erected by John Frederick Herbin at Grand-Pré in 1909 to mark the location of Saint-Charles-des-Mines cemetery. One can also see the Parks Canada sign providing a few details about the cemetery. 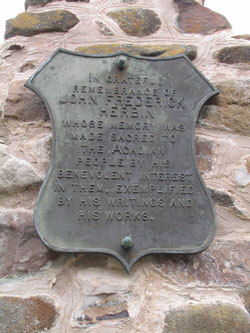 In 1925, a group representing the Acadians placed a bronze plaque on the stone cross to pay tribute to John Frederick Herbin (1860-1923) for his efforts to save the land that once formed the heart of the pre-Deportation village of Grand-Pré. Map of Grand-Pré National Historic Site by archeologist Jonathan Fowler showing the possible boundaries of Saint-Charles-des-Mines cemetery. Sally Ross was born in Halifax, Nova Scotia, Sally Ross studied and worked in France for 10 years. In addition to a B.Sc. and her M.A. from Dalhousie University, she has a Licence ès Lettres and her doctorate from the Université François Rabelais in France. After returning to Canada, she taught Acadian and Quebec history and culture for 11 years. Sally has been working as a writer, translator, and learning resource consultant since 1983. She co-authored with the late Alphonse Deveau the prize-winning book The Acadians of Nova Scotia (Nimbus Publishing). Her latest book, Les écoles acadiennes en Nouvelle-Écosse, 1758-2000, published by the Université de Moncton, traces the history of public schools in the Acadian regions of Nova Scotia. It is a factual, but moving story about the struggles for French education in an English-speaking province of Canada. Sally Ross has published numerous articles on Acadian culture, including: "Acadian Cemeteries in Nova Scotia: A Survey,"published in the Annual Journal of the American Association for Gravestone Studies (Markers XXII), 2007. She has been a member of the Special Events Committee at Grand-Pré National Historic Site for a number of years and for the 2008 tourist season she had the privilege of serving as Media Relations Officer for the Société Promotion Grand-Pré. Her latest translation, Acadian Mi-Carême: Masks and Merrymaking (by Georges Arsenault), will be launched in February 2009 by Acorn Press, Charlottetown. Susan Surette-Draper grew up in Ste Anne du Ruisseau also known as Lower Eel Brook in Yarmouth County, NS, where her family has lived for 7 generations. In 2002 she re-entered the workforce, as an interpreter at Grand-Pré National Historic Site, where she has worked for 6 years. The Congrès Mondial Acadien of 2004 and the events marking the 250th anniversary of the Deportation of the Acadians in 2005 were highlights. Susan and husband Ernie have lived in Port Williams, NS, for 25 years. Now that their son, Alex has "left the nest", Susan has more time to devote to her plan of uncovering the details of her family history. In 2004 she wrote the booklet “Return to Acadie. A Self-Guided Memory Walk of the Annapolis Valley” as a tool for anyone interested in discovering the Annapolis Valley from an Acadian perspective. It has been well received by tourists and locals alike. As an Acadian who can trace her ancestors even further than Catherine Bro of Rivière au Canards and Pierre Suret II of Annapolis Royal, who were married in the church of St Charles des Mines in Grand-Pré on Sept 30, 1732, Susan is glad to share her knowledge of the Acadian story with everyone.